Create a legally binding Idaho Bill of Sale with our attorney-drafted template! What Is an Idaho Bill of Sale? An Idaho bill of sale is a written document that outlines the exchange of ownership rights of the named or described property. For certain types of property that must be registered with the state, a bill of sale is often a legal requirement. In other instances, like the selling of a dining room table or television, a bill of sale acts as documentation of the ownership interest. Regardless of its use, both the buyer and the seller should sign and date the bill of sale as well as keep a copy once it is completed. What Are Some Common Bills of Sale Used in Idaho? In Idaho, the most commonly used bills of sale include a general bill of sale, a bill of sale for a motor vehicle, a bill of sale for a boat, and a bill of sale for a gun. Each type will have its own elements that must be included. It is important that they are included because in a bill of sale that has to do with a vehicle or a boat, you'll need to record certain information. However, all bills of sale have some common inclusions. Those items are the full legal name of both the buyer and the seller, the legal address of both the buyer and the seller, and the driver's license or state ID number of both the buyer and the seller. How Do I Write an Idaho Bill of Sale? An Idaho bill of sale can be written on paper or it can be typed into a document. You can use plain English as long as you remember to include all of the necessary items. Remember, a bill of sale should always include the printed or typed full legal name, physical address, driver's license or state ID number, and signature of both the buyer and the seller. An Idaho general bill of sale is used for items such as a television, laptop, tablet, or other personal or household items. In addition to the identifying information of both the buyer and the seller, you'll need to include a description of the property. If the item has a serial or registration number, you should include it. The description of the property should be detailed. For example, a black Dell laptop with a 350 GB hard drive, CD-ROM, and 15" monitor; serial number #0000000. Next, you should enter the trade or purchase price first in words and then in numbers. For example, three hundred and fifty dollars and zero cents ($350.00). You should then include the date that the payment is made. 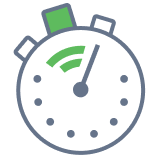 This is particularly important if the payment isn't made on the date that the bill of sale is created. 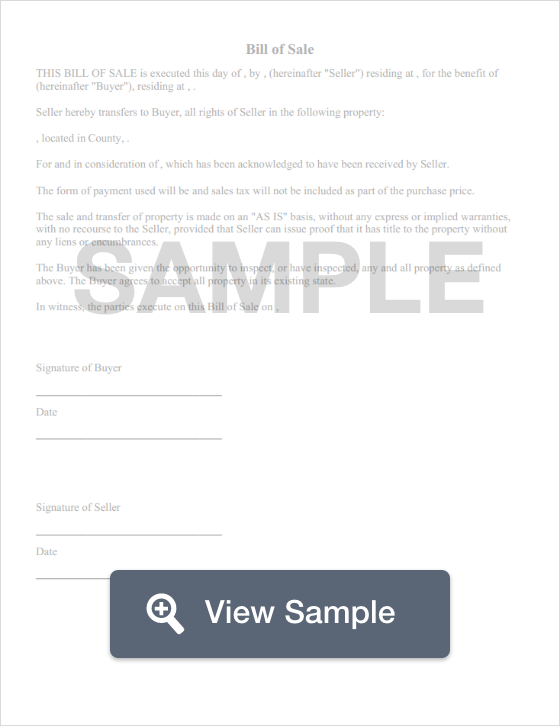 The document should include the date that the bill of sale is created. If there is a trade, that should be detailed in the bill of sale. If there are other terms to the sale, those should also be outlined. An Idaho general bill of sale must include a seller's disclosure. In a seller's disclosure, you must inform the buyer if the item has any known defects. While an Idaho general bill of sale should be signed and dated by both the buyer and the seller, there's no legal requirement that states it must be notarized. Remember that both the buyer and the seller should keep an extra copy of the completed bill of sale for recordkeeping purposes. The State of Idaho provides a bill of sale form for motor vehicles. In addition to the required personal information for both the buyer and the seller, you need the vehicle or Hull identification number, title number, VIN, weight, length, width, vehicle year, vehicle make, and vehicle model. You should also include a description of the vehicle. For example, a blue four door sedan. You must then list whether the vehicle is a rebuilt salvage, a previous brand, reconstructed, or if it was repaired. An Idaho bill of sale for a motor vehicle must include the odometer reading along with whether it is the actual miles, if there is no odometer, if it exceeds mechanical limits, or if it is exempt. The bill of sale must include the true selling price of the vehicle along with the sale date. It must also include the name and address of any lienholder. There must be a seller's disclosure that agrees to sell the vehicle for the listed price and that certifies the odometer reading as accurate to the best of the seller's knowledge. It must also certify that the seller has accurately disclosed all known brands associated with the vehicle. The seller must also agree to give a release of liability statement to the buyer within five days of the sale. When the seller signs, they are stating that they understand that if they lie on the form, they could be charged with a felony. When the buyer signs, they certify that they are aware of the odometer reading and that the seller is required to tell them any brands that are placed on the vehicle. They also agree to apply for a title within 30 days or that they would be subject to a punishment. An Idaho bill of sale for boats must include the personal and legal information of both the buyer and the seller. It must also include the make, length, and year the boat was built. Next, it should include Hull ID and registration ID. You need to list the odometer reading in hours as well as the title number. If a trailer is going to be included in the sale, you should enter the make and model of the trailer. If there is no trailer, that should be specified. If an outboard motor is included, you should list the make, year, and horsepower. If no motor is included, that information should also be included. The cash or trade price for the boat should be listed first in words and then in dollars. For example, one-thousand, five hundred dollars and zero cents ($1,500.00). The bill of sale should include the date it was created and the date that the payment for the boat will be made. If there are other terms of the sale, those terms should be included. If there is a trade that will occur, the details of the trade should be listed. If the boat is being given as a gift to the buyer, that should be disclosed in the bill of sale. Next is the seller's disclosure. The seller's disclosure in an Idaho bill of sale for a boat is used to inform the buyer of any known defects. It should be signed and dated by both the buyer and the seller. There is no legal requirement to have the bill of sale notarized. An Idaho bill of sale for a gun must include the full legal name, physical address (including city, state, and zip), date of birth, and driver's license number for the buyer and the seller. The document should include the date that it was created. The bill of sale must include the make, model, caliber, and serial number of the gun. For the trade or purchase price, the dollar amount must first be written in words and then as a number. For example, seven-hundred and eight-five dollars and no cents ($785.00). The bill of sale should list the date that payment for the gun should be made. If the gun is a gift, that should be disclosed in the bill of sale. If there are other conditions or if there is a trade involved, that information should be included. It is important to note that while there are very few laws that regulate the private sale of a gun in Idaho, you may not sell a gun to any minor under the age of 18 without parental consent, to known gang members, or to someone who will give the gun to a gang member. The bill of sale should be signed and dated by both the buyer and the seller. Is an Idaho Bill of Sale Required to Register a Vehicle? Yes. An Idaho bill of sale is required to register a vehicle. In Idaho, a bill of sale lists the amount that the buyer pays for the vehicle. The amount listed on the bill of sale is the amount that the State of Idaho will use to calculate the tax that is due. In addition to an Idaho bill of sale, you'll need proof that you're an Idaho resident (or Idaho business), a title to the vehicle, a VIN inspection, proof of current registration, your identification, and the full amount due for taxes and fees. If you don't have a title for the vehicle, you'll need to prepare an application for title and file it with the Idaho Transportation Department or county assessor motor vehicle office within 30 days of receiving the vehicle. You'll need a copy of your bill of sale, a VIN inspection, an odometer disclosure, and be prepared to pay the associated fees. Although the Idaho Department of Transportation website doesn't list a requirement to show proof of insurance as of February 2018, it's a good idea to take proof of insurance with you. Is an Idaho Bill of Sale Required to Register a Boat? A completed Indemnifying Affidavit (Form ITD-3410). You must also take a copy of a bill of sale, a release of interest (and a lien release if the boat has a lien), and a Hull ID number inspection if it is the first time that the boat is registered in the State of Idaho. If you're applying for the title through the County Assessor, you'll need to include a completed power of attorney. You must be prepared to pay your title and registration fees in full. Is a Bill of Sale Required to Register a Gun in Idaho? No. Guns are not official registered in Idaho. While a bill of sale isn't a legal necessity for a gun, it is an excellent recordkeeping tool. To learn more about Idaho's gun laws, click here. Create a free Idaho Bill of Sale in minutes with our professional document builder.